With its sales and profits currently driving ever upwards, KTM is poised to embark on a massive further expansion in production, this time in partnership with CFMoto in China. This was previewed by the unveiling at its Chinese partner’s annual dealer meeting last December of the avantgarde CFMoto V.02 NK Concept model, designed in Italy and powered by the 990 version (actually, 999cc) of KTM’s 75-degree V-twin LC8 engine, which will be exclusively manufactured in China from 2020 onwards to power an all-new range of models carrying the CFMoto name. But, alongside this, KTM president Stefan Pierer has established a joint venture/JV company in conjunction with CFMoto owner Lai Guogui, which will see manufacture of KTM’s entire future range of middleweight models powered by its new 799cc LC8c parallel-twin engine - which just made its global debut in the recently launched 790 Duke - transferred to China from 2020 onwards, as part of his new five-year plan to manufacture 400,000 KTM and Husqvarna motorcycles annually by 2022. However, KTM sources insist that neither Pierer nor his Indian partner Rajiv Bajaj personally, nor KTM or Bajaj Auto corporately, acquired any CFMoto stock when 25% of the Chinese company was floated on the Shanghai Stock Exchange last August. The two companies remain separate independent business entities. KTM Industries AG achieved a seventh consecutive year of record sales in 2017, retaining its status as Europe’s No.1 motorcycle manufacturer with a record 238,334 KTM and Husqvarna motorcycles sold in 2017, an increase of 17% over 2016, with 56% of them delivered outside Europe. This brought 14% larger annual revenues of Euro 1.533 billion, with 8% higher EBIT (operating earnings - aka gross profits - before interest and taxes, but after depreciation) at Euro 132.5 million. Just over 150,000 of these units were manufactured at KTM’s Mattighofen home factory in Austria, with around 90,000 examples of its 125/200/390cc single-cylinder model families produced by its Indian partner (and 48% shareholder) Bajaj Auto at the firm’s massive Chakan factory outside Pune. Bajaj sold 47,000 examples of those KTM models locally in India and Nepal last year, with others shipped overseas as fully built-up machines to Europe, North America and Australasia, and the remainder in CKD form to KTM’s six offshore assembly plants in Malaysia, the Philippines, Brazil, Argentina, Colombia - and China. There, KTM’s existing partnership with local privately-owned manufacturer CFMoto had already commenced in April 2014, when its Hangzhou factory 200km/125 miles southwest of Shanghai began assembling Indian-made 200 and 390 Dukes for sale exclusively in the People’s Republic under the KTM R2R brand name (the KTM trademark had been hijacked by a speculator, who wanted several million dollars to release it!). 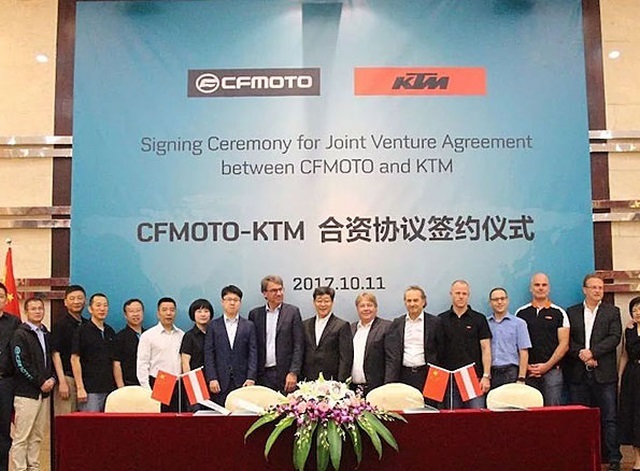 But now that collaboration is about to become much more intensive, after the signing on October 11 last year in Hangzhou by Stefan Pierer and Lai Guogui of an agreement establishing a joint venture/JV company known as CFMoto-KTMR2R, in which CFMoto holds a majority stake of 51%, with the remaining 49% held by KTM. This was originally presented in best anodyne corporate PR-speak as being to “not only strengthen KTM’s appearance in the Chinese market, but also collectively develop and manufacture products to continue the global expansion course”. However, this disguises a much more significant strategy, which will see Hangzhou become KTM’s third global manufacturing site (as opposed to CKD assembly only) from 2020/21 onwards, alongside Mattighofen and Pune. For its own models CFMoto has purchased KTM’s entire first-generation LC8 990 engine platform, which first appeared in carburetted 942cc form in 2003, then increased in capacity to 990 guise in 2006, now boasting EFI instead of carbs and delivering 98bhp. This Dakar-winning motor (Fabrizio Meoni in 2002) formed the basis of KTM’s original twin-cylinder customer range launched in 2003, until it was replaced by the all-new 1190 version in 2013, having been progressively improved during its ten-year lifespan to eventually deliver 116 bhp. CFMoto now has exclusive use of this engine to power a range of models bearing its own name, which initially at least will be exclusively aimed at the Chinese market, but as its president Lai Guogui is eager to underline, the Chinese manufacturer will itself develop a revised version of the KTM 990 motor in order to achieve this. Its engineers have been working with their counterparts at KTM on modifying this engine before it goes into production in China, when it’s reliably understood that the actual displacement will be around 1080cc, and that both power and torque will be higher than the original KTM 990 engine. 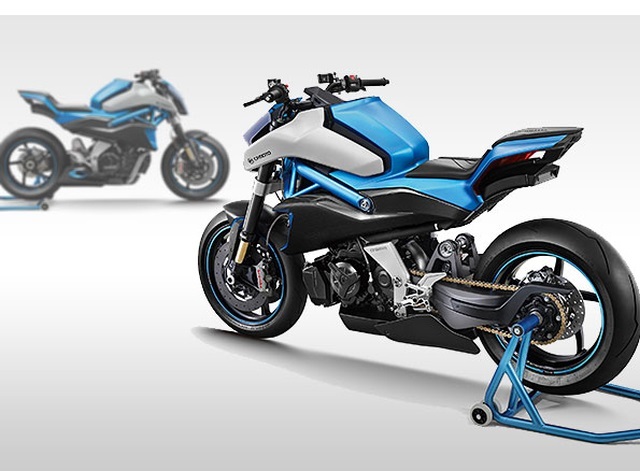 In preparation for manufacturing this range of models, ground was broken early in March this year on construction of an all-new manufacturing plant directly opposite CFMoto’s existing factory, with a potential annual capacity of 50,000 motorcycles. That’s where the CFMoto 990/1080 V-twin models will be built – alongside, starting in 2020, KTM’s all-new parallel-twin range powered by the 799cc RC8c (for compact) motor, which debuted at the EICMA Milan Show last November powering the 790 Duke now in production, as well as the 790 Adventure dual-purpose model displayed alongside it. That’s up next, and further 790 models will follow – but production of all of them will be transferred to Hangzhou from 2020 onwards. “We have been very positively impressed by CFMoto’s quality of manufacture, attention to detail, and engineering capability,” says Florian Burguet, Managing Director of KTM Sportmotorcycle AG. “Accordingly, from 2020/21 onwards, we have decided that Hangzhou will host the entire production of KTM’s mid-class models for the global market, with the expectations that our CFMoto partners will produce up to 50,000 KTM motorcycles per year there.” This will allow the KTM/CFMoto JV to export those middleweight KTM (and Husqvarna?) parallel-twin models in fully built-up form - but at a lower price, because of reduced manufacturing costs in China - to developed markets such as Europe, the USA and Australasia, as well as to ASEAN countries with which China has a free trade agreement. They’ll also be sent in CKD form to KTM’s assembly plants in South America, as well as to Bajaj in India, for them to assemble them locally in order to avoid import duties, in a neat turnaround of the existing arrangement for the Indian-made Duke singles! This will deliver much-needed extra capacity at KTM’s Mattighofen home factory, which has an effective production ceiling of 200,000 units per year, and in 2017 already utilised 75% of that. And almost inevitably, it’s understood that we could also see an adventure bike from CFMoto using the KTM 790 engine! Mr. Lai however originally declined to give more details on the genesis of the showbike, and especially who created it for him. 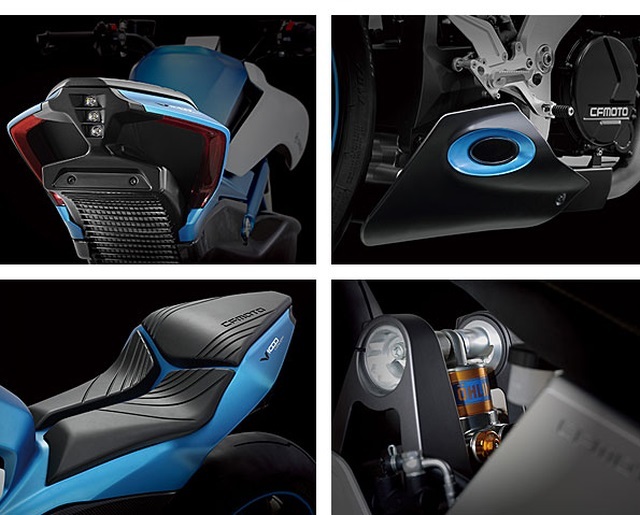 But some detective work in Italy has uncovered the designer, thanks to the clue provided by the distinctive extractor fans beneath the seat for cooling the rear-mounted radiator. This was a design feature found on the Benelli Tornado and TnT triples which debuted in 2003, and continued in production until 2014 after the Italian trophy brand was purchased in 2006 by China’s second-largest manufacturer Qianjiang/QJ. The man who designed the V.02 Concept bike for CFMoto has now been confirmed as former Benelli CEO Pierluigi Marconi, one-time chief engineer at the prestigious Rimini-based Bimota sportbike factory, for which he invented the hub-centre Tesi design as well as its best-selling model ever, the Suzuki GSX-R1000 powered SB6 model, of which 1,744 examples were built between 1994 and 1999. Against that, though, Marconi was also responsible for the disastrous 500cc two-stroke Vdue twin which ultimately proved to be Bimota’s nemesis. After leaving Bimota in 1999, Marconi first worked for Aprilia in designing the RST1000 V-twin sports tourer, and then joined Benelli in 2002, initially as Chief Engineer, then later as CEO after the QJ takeover in 2006. He thus has extensive experience of working for a Chinese manufacturer, until he left Benelli in 2010, frustrated by the lack of new product in the wake of the 2008 GFC. After spells working for Gas Gas and (briefly) for Bimota’s new management, in 2017 he founded his own design house in Cesena, not far from Rimini, and it’s there that he created the CFMoto V.02 Concept bike last summer, together with a team of former Bimota and Benelli designers. “Yes, it’s true that we created the Concept model here in Cesena, using the KTM LC8 V-twin engine as the basis of it,” said Marconi. “However, the terms of my contract with CFMoto absolutely forbid me to discuss the details of this with you or any other journalist, so I can’t say any more, except for one thing. CFMoto is the finest and best-run company I have yet worked with, and it’s especially been a pleasure to know Mr. Lai and his son, who ever since they first came to visit me in December 2016 have given clear instructions about the project, and displayed both passion and wisdom in following its creation. I do have considerable experience of working in China, and they and their company are on a higher level in terms of understanding Western markets than any other manufacturer there I’ve yet had dealings with.” That’s praise indeed…. The details of Marconi’s design may be officially undisclosed, but it’s evident from looking at it that this could readily reach production as a power-up big brother of CFMoto’s current strong-selling 650NK Naked roadster. The composite frame with a tubular steel upper spaceframe attached to large aluminium engine plates comprising the pivot for the single-sided swingarm is a trademark Marconi format, here with another distinctive feature he worked on at Benelli, the underseat radiator with twin extractor fans created by the Tornado’s designer Adrian Morton – now chief designer at MV Agusta. However, on the Benelli the fans were on the outside of the radiator, so they were effectively cooling the hot air after it had escaped from that. Here, Marconi has repositioned them inboard, so they’re blowing cool air fed by the huge carbon fibre side ducts in the bodywork, at the hot coolant. Positioning the radiator rearwards, as first done by Kiwi visionary John Britten on his legendary V-1000 racer in 1991, then adopted for the street in 1995 on the British-built Triumph-engined Saxon Radika road bike, allows the engine to be mounted much further forward in the wheelbase to optimise weight distribution and deliver a more compact build, both of which appear to have been achieved on the very purposeful-looking CFMoto V.02 (as in - V-twin, presumably?). This employs Öhlins suspension front and rear, with the Monoblock Brembo radial front brake calipers gripping carbon discs to be replaced by steel ones if the bike enters production, as Mr. Lai insists it will. Watch this space…. Fuelled by its joint venture with KTM, CFMoto is about to enter uncharted waters for a Chinese manufacturer in developing and marketing the most powerful range of motorcycles yet manufactured in the People’s Republic by a local company. But in aiding its Austrian partner to free up capacity at its Mattighofen home plant by talking over the entire production of the recently-launched 790 Duke, as well as all future spinoff models, CFMoto is also about to play a major role in allowing Stefan Pierer and his team to keep building production numbers, as well as to leave vital space in Mattighofen for future expansion of what Pierer hopes will be the successful comeback on the streets of his Husqvarna brand. And perhaps most important of all, the lower prices for the 790 Duke and its sister models which manufacturing them in China will surely entail, will mean that KTM will become super-competitive in the global 501-900cc Roadster aka Naked Bike category, where worldwide annual sales are presently pegged at 130,000 units, and are building all the time. West meets East – and the customer looks set to benefit from the mid-size products of Europe’s No.1 being manufactured in China, For this will render them competitive pricewise with their Japanese rivals, especially Yamaha’s class-leading twins and triples, while offering extra performance – partly via a superior power to weight ratio - as well as a more sophisticated specification, with the most advanced electronics in the category included as standard. And while the KTM V-twin-powered CF Moto models are initially being developed for sale in its Chinese home market, if Lai Guogui follows the same strategy as with each successive new 650cc parallel-twin model in the past, it’s only a matter of time before China’s first large capacity sportbikes make their way overseas. 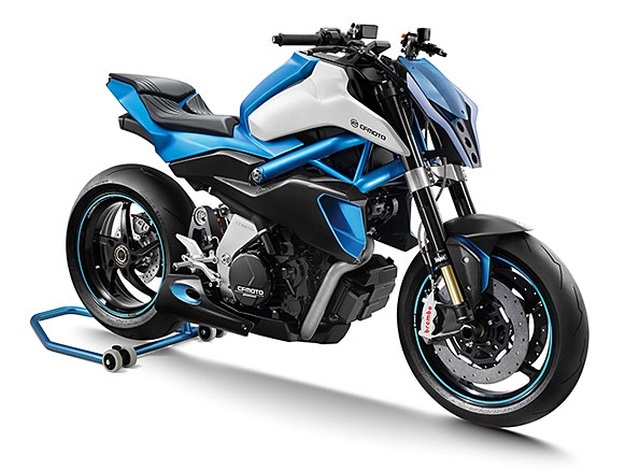 Judging by the V.02 Concept bike that kicks off this new family of models, they should be worth waiting for – especially at the appealing price they’re bound to be sold at, which is likely to undercut all other equivalent models very significantly.